Bariatric Shower Trolley - TR 4200 Atlas Junior | H.S.-medplan Kft. TR 4200 Atlas Junior is a battery operated bariatric shower trolley with a Working Load Limit of 240 kg / 600 lb. 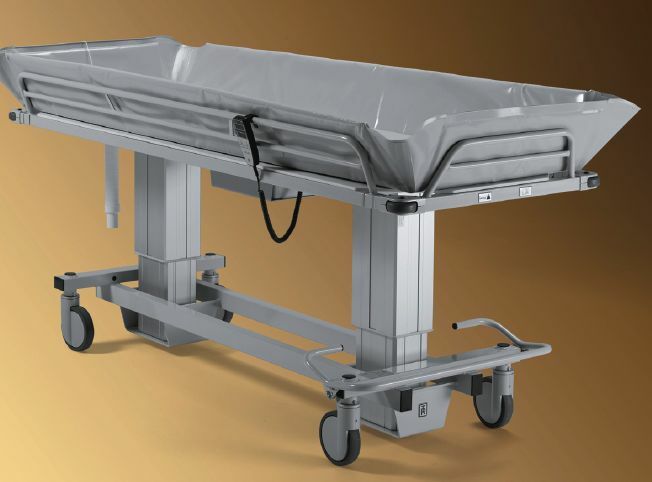 The trolley is suitable to use for showering, transport, as a changing or treatment trolley, the possibilities are endless. The trolley has a hand control for tilting and height adjustments and large castors with brakes and straight steering which makes it easy and safe to handle. The trolley can be used immediately after unpacking and comes with battery charger, mattress, pillow and flexi drain hose.